I am a chocoholic too! And my favorite of them all is none other than... tadaaaaaaaah! 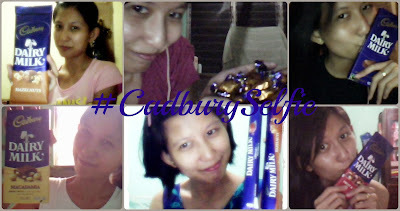 Yes, I am a Certified Cadbury Addict :) I learned about this right after I saw mom's cadbury wrapper neatly folded in a book so she can easily send it to dad when she writes a letter. Before, videocalls even long distance calls are so expensive and snail mail is in demand. What my mom would usually do is to include an empty wrapper of her favorite chocolate and a latest picture. When my dad writes back, along came chocolate and his picture as well, sometimes, a voice tape. So sweet isn't it? So now, I am collecting cadbury selfies with different cadbury flavors. In this picture (1) Cadbury Hazelnuts (2) Cadbury Eclairs (3) Cadbury Original (4) Cadbury Macademia (5) Cadbury Treats in Original and Hazelnut (6) Cadbury Fruits & Nuts. How about you? What's your favorite chocolate and do you also have candid shots of it?